Telugu film industry is always proud of its actors. Especially it is because of senior hero Nandamuri Taraka Rama Rao, we have got that respect and attention to the film industry. He has done everything an actor can do. Sr NTR has portrayed all kind of roles. He has essayed different roles with versatility. He has proved that there is nothing he can not do. He even entered into the politics and had shown a unique mark of his by occupying the chief minister throne. His daring and dashing attitude is much talked and praised. He is the pride of our Telugu people. The same is the case with his son Balakrishna. Nandamuri Balakrishna also started his journey following his father footsteps. He has made his mark in both films and politics and enjoying the senior hero status currently. With the career spanning over 40 years, Balakrishna has finally reached the milestone of the 100th film. His next film titled Gautamiputra Satakarni is being made in the direction of Krish. On the account of the actor’s birthday today, the makers have released a new poster of the film which is attractive. Balayya is taking a lot of care for the film and is planning to release it for next year Sankranthi. 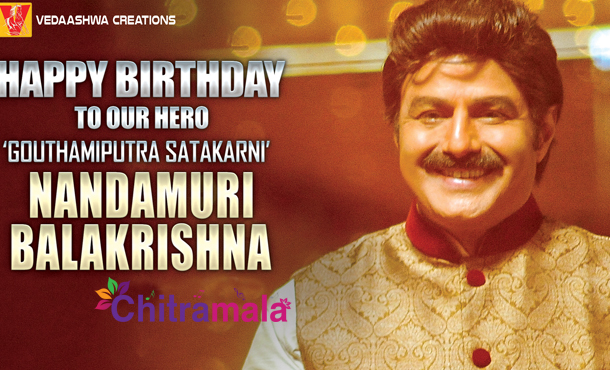 Chitramala wishes Balakrishna a fantastic birthday and hope he makes us proud like his father.